In December 2018 unemployment in Kern County is almost four percent higher than unemployment in the state of California. The Bakersfield City School District (BCSD) is hoping to change that with its inaugural career fair. BAKERSFIELD, CALIF. — In December 2018 unemployment in Kern County is almost four percent higher than unemployment in the state of California. The Bakersfield City School District (BCSD) is hoping to change that with its inaugural career fair. Coyolxahqui Mata always wanted to work in education. She’s been looking for a position for awhile. Mata is just one of at least community members who attended the Bakersfield City School District’s career open house. “It’s an opportunity to share with our community and stakeholders all of the different positions and job that we have in the Bakersfield City School District,” said Diane Cox, Assistant Superintendent of Human Resources. And the District hires more than just teachers. “People think of a school district and think there’s just teaching positions when in fact we have transportation, we have nutrition, we have technology, we need people for classroom aide positions. there’s just a myriad of all kinds of positions,” said Cox. Although unemployment is higher in county than it is in the rest of the state, the number of unemployed has decreased from the year before, according to the state of California’s Labor Market Information Division . “For us we’re one of the larger employers in the district and again i think it’s just a great opportunity for people even if they’re currently employed to see what else there is out there for them,” said Cox. 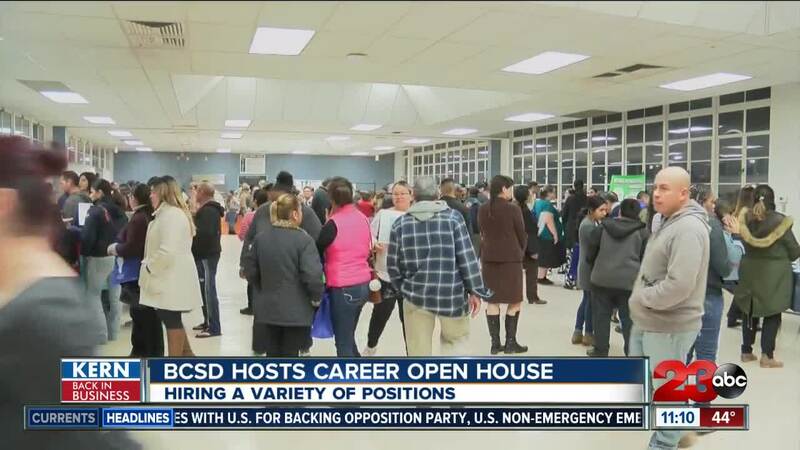 If you didn’t get a chance to make it out to the career open house, you can apply online at BCSD.com.